Join the City of Madison and the Madison Public Market Foundation on Wednesday, May 8 to share feedback on updated designs for the Madison Public Market and to tour the building that will be the Market’s future home. Our design team has begun their work and we are looking to hear your thoughts on the initial plans. You’ll get an update on the latest designs for the Market, a chance to sample tasty treats from local merchants, and a first look at the immense opportunity unfolding at the corner of First and East Johnson Streets. Stop by this open house style, free event! Online RSVP appreciated, but not required. Getting to our Market home is easy! Vehicle parking for this event is available in the shopping mall lot. Bike parking is also available. You can plan your bus ride with Madison Metro on Google Maps. Posted in UncategorizedLeave a Comment on Get a Sneak Peek of the Future Public Market on May 8! 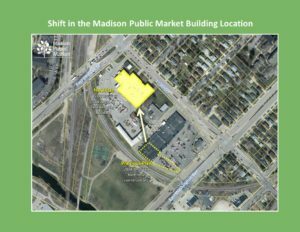 On Tuesday, the City of Madison Common Council made significant progress in moving forward the development of the Madison Public Market. In three resolutions sponsored by alders Larry Palm, Amanda Hall, and Marsha Rummel, the Council approved the Collaboration Agreement with the Madison Public Market Foundation and city staff’s recommendation for architect and engineering design services. 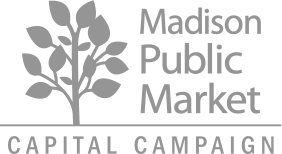 In approving the Collaboration Agreement with the Madison Public Market Foundation, the City officially empowers the Foundation to select vendors to operate within the Public Market, hire staff to operate the Market, advise and provide input on the final design, and secure funds to ensure the successful launch of the Market. Along with these responsibilities, the City grants the Foundation seed funding to move forward with a complete operating agreement. In October 2018, after reviewing 11 proposals from Madison and around the country, City staff put forth a recommendation to the Common Council to engage an architecture and engineering team led by Minneapolis-based Meyer, Scherer & Rockcastle (MSR) to complete the design of the Madison Public Market building. With Tuesday’s approval by the Common Council, MSR can start the design process for the site at the corner of First Street and E. Johnson Street. This development marks a significant milestone in making the Madison Public Market a community-driven, inclusive destination for the Madison region. You can be part of the initial momentum with a gift today. January 29, 2019. Madison’s nonprofits provide critical services that ensure the city’s rich resources are accessible to all its residents. In turn, they rely on the support of donors and the larger business community. So many private business leaders step up to the plate every day, knowing their employees value service and the opportunity to give back. These efforts not only benefit the populations each nonprofit intends to serve, but all of us. This is good, old-fashioned, genuine community building, and it’s alive and well in Madison. With this section, we honor our local nonprofits and the companies that go the extra mile to keep them running strong. Imagine a bustling, vibrant, 45,000-square-foot public market showcasing the best of Madison’s local food and handmade goods. A treasured destination and important economic driver melding a 21st century local food economy with innovation and growth, particularly for communities that traditionally face barriers to entrepreneurism. Yet another spectacular landmark for which this city becomes famously known: Capitol Square. Monona Terrace. The Overture Center for The Arts. And, in 2021, the Madison Public Market. “When we look at the best cities across our country and the world, most of them have thriving, colorful public markets. Madison is long overdue for a public market of our own,” said Jamaal Stricklin, Madison Public Market Foundation president. January 28, 2019. Mayor Paul Soglin recently announced updated plans for the Madison Public Market. This year-round market space, which will be home to local food and retail vendors, will now be located at the corner of First Street and East Johnson Street, rather than at the corner of First and East Washington Avenue. The city-owned Fleet Services building currently occupies this site and will undergo renovations to become the Public Market when Fleet Services relocates in 2020. The previously proposed market site is next door to Fleet Services, where the privately-owned Washington Square shopping plaza is currently located. The future Public Market site sits directly next to Burr Jones Park along the Yahara River, provides more square footage than the original development plans, and the renovation of the existing building is projected to provide cost savings when compared to the costs of new building construction, according to the city. Plans for the market include an outdoor seating area, access to water and greenspace, a performance stage and vendor space. Madison Public Market’s MarketReady Program, which is operated by the Northside Planning Council, works in collaboration with the city to support a cohort of 30 food and retail business entrepreneurs from diverse backgrounds as they prepare to apply for a spot in the market, with the goal of creating a market that is representative of Madison’s population and cultural diversity. December 19, 2018. There’s been talk of a public market in Madison for years. Mayor Paul Soglin moved the idea forward when he created the Public Market Development Committee to research a market in 2012. The city council approved the idea in 2015 with the original plan to move into the City Fleet Services building at 200 First St. The proposed location changed since then, but as of this month the current plan is back to the Fleet Services building. Dan Kennelly, city manager of the Office of Business Resources, agrees. “The Madison Public Market project is building momentum,” Kennelly says. “2018 has seen a lot of progress. This includes the Madison Public Market Foundation Board being formally selected by the city as the future operator of the market and launching a fundraising campaign that has raised nearly $1 million.” Kennelly also says the site change back to the location at the Fleet Services building — as opposed to a brand new building at the corner of East Washington Avenue and First Street — is positive. “The Fleet Building is a solidly built, 50-year-old facility that has been used to maintain large vehicles. The building is 45,000 square feet with three large garage bays, 20 foot high ceilings and big overhead garage doors. Reusing a big old garage will also result in a market that has unique character and architectural interest,” Kennelly says. But while city council members have been hashing out details and architects have been drawing up plans, a group of 30 entrepreneurs — the heart and soul of the Madison Public Market, say its organizers — have been busy since 2017 creating business plans, purchasing equipment, touring other public markets and taking business classes with support from the city’s MarketReady Program. While the location of the Madison Public Market itself may e in question, there is no question that the vendors who have been chosen to populate the market are ready to sell their goods and services. This holiday, you can visit the market website’s commerce page and explore what they have in store for the holidays. We thought we would give you a hand by highlighting a few and letting you know where you can find them as you prepare to do your holiday shopping. You can find links to explore all vendors at madisonpublicmarket.org. With land costs too high to put a $13.2 million Madison Public Market on East Washington Avenue, city officials are embracing an option to reuse the nearby city Fleet Services building for the market. Mayor Paul Soglin announced Monday that the city is dropping its bid to acquire land to build the market as part of a coming private redevelopment of the Washington Square shopping center at the corner of First Street and East Washington. 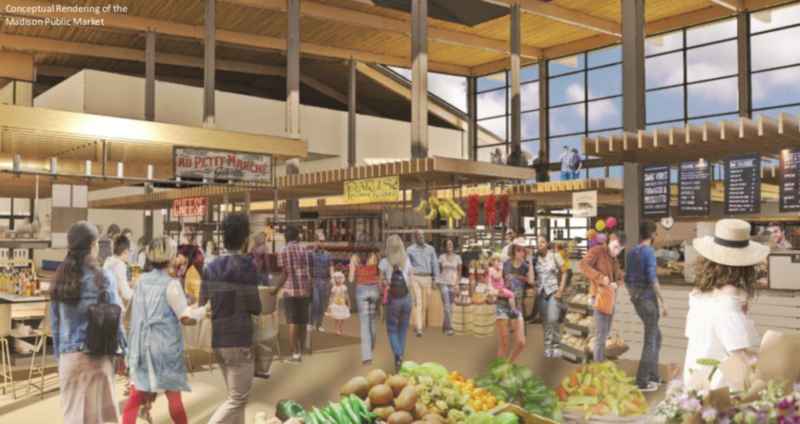 Today, Madison Mayor Paul Soglin will officially announce an update about the future home of the Madison Public Market. The location of the Public Market will continue to stay at the same overall near east side location, but the Market building site will shift over 250 feet from the corner of First Street and East Washington to the adjacent City-owned Fleet Services property at the corner of First Street and E. Johnson St. Previously, the City had been engaged in ongoing conversations with the owners of the Washington Plaza Shopping Center to locate the Market within their private development. Now that the Fleet Services Division has a plan and budget authority to relocate to a new facility, Mayor Soglin and his team believe the soon-to-be vacated Fleet Services building is a much stronger fit for achieving our community’s vision for the Public Market. Same overall location: Because it’s the same overall location, all work done so far including site analysis, fundraising, and the MarketReady program will be consistent and unchanged. 60% larger space: The Fleet Services building is 45,000 square feet, compared to 28,000 square feet in the previous Shopping Center redevelopment. The larger space will enable us to better meet the overwhelming response by interested vendors (nearly 200 entrepreneurs have submitted formal interest), in addition to better achieving our plans for the Food Innovation Center at the Market, a regional food hub to expand local food distribution, processing, and other important systems needed to better meet the demand for local food across the County. 4 times the lot size: Fleet Services is on 3.5 acres, offering much more space to build the outdoor plaza, including outdoor seating, a performance stage, and perhaps food cart areas. The Market will still be connected to Burr Jones Field and the Yahara River. Added car and bike parking: We’ll have room for significantly more parking. More accessible for large delivery trucks and traffic flow: Being located off of the corner of E. Johnson instead of E. Washington, makes more a much imporoved traffic flow for large and small vehicles alike. Sustainability: Reusing an existing building is more sustainable than building new and the flat roof allows for consideration of green roof options. The Mayor adds that the owners of the adjacent shopping center can move forward with their redevelopment project independently but still integrated with the market. This project continues to move forward with housing, retail, and potentially a hotel. The private development will continue to be a huge asset for supporting the health of the Market. The budget for the Market at Fleet Services is expected to remain consistent with the City’s approved $13 million budget that was reauthorized in the 2019 capital budget. Recently Minneapolis-based architect MSR along with local firms Ken Saiki Design and Vierbicher were recommended by the City staff as the project’s design team. MSR is a great fit for the project as they have strong experience in retrofit projects, such as Madison’s Central Library and the Madison Municipal Building. The updated timeline for the project will become more precise once the design process commences and Fleet Services begins construction at their new site. Current estimates are that Fleet Services will move to their new facility in 2020, allowing the renovation for the Public Market to be completed in 2021. For now, all key stakeholders including the City of Madison, Madison Public Market Foundation, and current private project funders are all in agreement that this project will continue to make strong, forward progress. 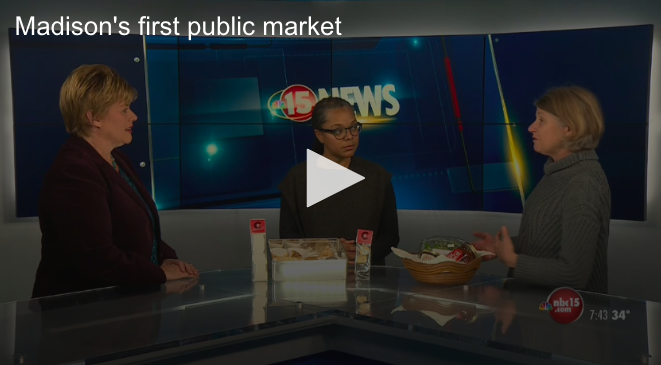 Madison Public Market Foundation board member Anne Reynolds and MarketReady merchant Monica O’Connell of Curtis & Cake chat with NBC15’s Amy Carlson.